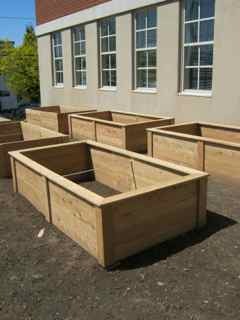 Greenwood Elementary School garden making progress! I live two blocks from Greenwood Elementary School in Seattle. I knew that they were adding a school garden and this week the beds appeared! All they need is soil and seeds! They picked a great spot, south facing in front of the brick building, so veggies should grow well and quickly. My top five reasons for creating a school garden are: as outdoor classrooms they bring students into contact with nature; I believe that students learn best through direct hands-on experience (and research backs me up on this), which school gardens provide; school gardens can be used to promote healthy eating habits; working in the garden encourages students to engage with each other around common tasks and in a cooperative way; and school gardens provide students opportunities to connect to the community. For the last point, community connections, I strongly encourage schools to dedicate at least some of their produce for the local school bank. I hope to eventually get down to Madison Elementary School in Olympia to view the program that they are doing in partnership with the Thurston County Food Bank that has kids at the school “buying” (with school created money) food to bring home from a farm stand that is made up of school grown produce and food bank produce that goes with recipes that the students have actually used in cooking projects at the school! ← Lots of events in May!